Photograph courtesy Doug Nicholls 25233 at Crianlarich on June 21st 1976 working the 12.55 Glasgow Queen Street - Oban. The nineteen year two month career of D7583/25233 was split between Scottish & London Midland depots, with over thirteen years allocated to three Scottish depots. March 1967 to London Midland (Midland) Lines (LMML). May 1978 to Eastfield . 25233 was the 166th Class 25 to be withdrawn. 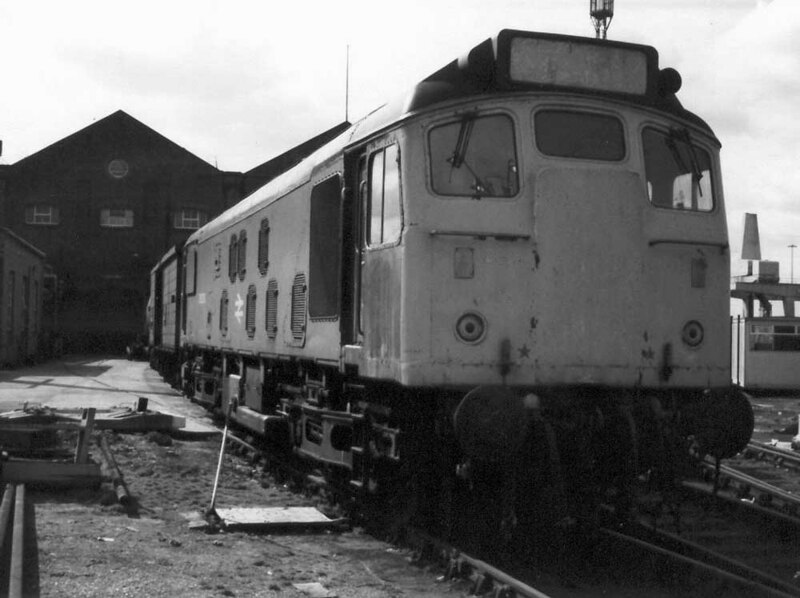 After withdrawal 25233 was stored at Cricklewood during June 1983 then noted at Etches Park by July 1983 before being moved into Derby Works by late October 1983. It was moved down to Swindon on February 4th/5th 1985 (see details below) and broken up there by the first week of May 1985. 25050/062, 25129/133/146, 25220/233/274/294 moved as the 9X12 Derby Works – Swindon Works February 3rd & 4th 1985. Noted Glasgow Works June - August 1969. Noted Glasgow Works October 1976. Noted Glasgow Works December 1979 (N4 repairs). January 5th found Mk IIC airbraked stock being introduced on several Euston - Glasgow services. This required the carriage pilots to be air brake equipped, Eastfield’s allocation included 7583 & 7584 for that purpose, frequently being found working in and out of Larkfield carriage sidings. For all the years that D7583/25233 was allocated to Eastfield, Haymarket & Inverness, the recorded passenger workings during this time have so far produced minimal results. 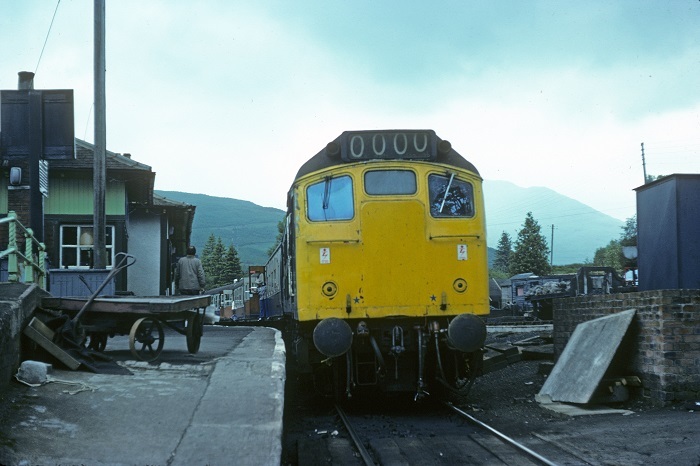 The first recorded working took place on August 5th 1972 when 7583 worked the SRPS 'The Rhum, Eigg and Muck' Falkirk Grahamston - Mallaig charter to/from Fort William, a total of 259 miles. 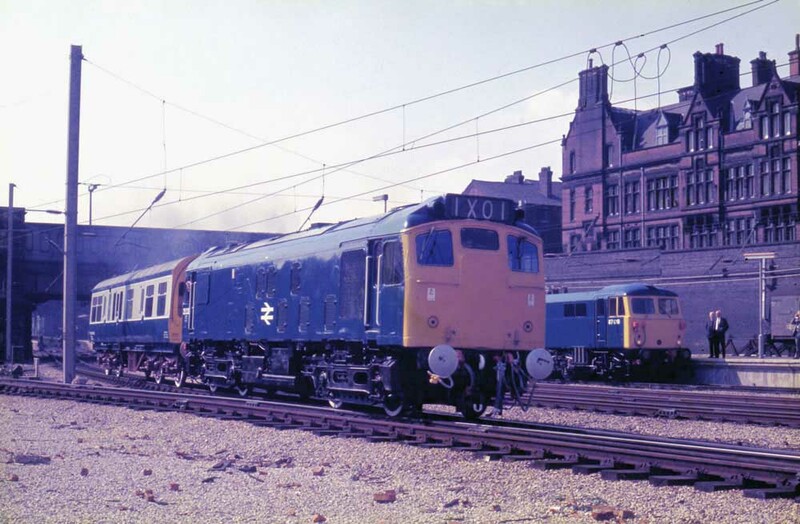 Its next passenger workings occur in 1974 in the Preston & Crewe area, the details of which are incomplete. Photograph courtesy Tom Sutch For the Queen's visit to Preston on May 7th 1974 25233 with a saloon was used to transfer the Queen from Preston station to the new Preston Power Box. After this adventure the Queen travelled north to Carlisle in the cab of 87018. By January 1975 25233 was back on the Scottish Region at Haymarket depot. On February 23rd the 10.15 Aberdeen - Kings Cross was noted working as far as Edinburgh with 47519 & 25233. The following month on March 27th the 12.11 Inverness - Glasgow Queen Street was noted behind 25233 & 26033. On June 21st 25233 worked the 12.55 Glasgow Queen Street - Oban. On September 19th 25233 worked an evening Glasgow Queen Street - Dundee service. As expected 25233 has been recorded on a number of roundtrip Glasgow - Dundee turns interspersed with longer distance jobs, including on January 20th the 07.52 Dundee - Glasgow Queen Street and the 18.04 Glasgow Queen Street - Oban. On August 20th 25233 & 25246 worked the 08.25 Glasgow Central - Blackpool North to Carlisle. Two weeks later on September 3rd 25233 & 25078 worked the 08.15 Inverness - Glasgow Queen Street. On April 4th 1978 25233 & 26042 were noted arriving at Ardrossan Harbour with a special from Chesterfield. 25233 and coaching stock were noted at Dundee on May 6th (with white headcode display at the No.2 end). September 16th 25233 stabled at Inverness. On a snowy February 5th 25233 was working the grain train at Dufftown (ex-Aberdeen), with about twelve wagons and a brake van. This freight also visited Burghead, where there was no snow. Amidst the Dundee workings during 1979 & 1980, on July 5th 25233 worked a Glasgow Queen Street - Oban, whilst on July 29th the 23.30 Glasgow Queen Street - Inverness was worked by 25233 the short distance to Cowlairs Junction, 47037 took the train forward. On August 26th the 23.30 Glasgow Queen Street - Inverness with 47149 utilised 25233 as the Cowlairs banker. On September 21st 25233 worked the 13.40 Glasgow Central - Carlisle. 25233 worked the 08.44 Glasgow Queen Street - Dundee on December 23rd. On April 11th 25233 worked the 06.40 Glasgow Queen Street - Dundee. 25233 was noted at Millerhill on April 25th. The 08.05 Glasgow Queen Street - Oban with 27019 utilised 25033 as the Cowlairs banker on September 17th. A short working for 25233 on November 6th was the 17.12 Aberdeen - Stonehaven. 25233 worked the 08.44 Glasgow Queen Street - Dundee on December 23rd. DUPLICATE OF 1979 WORKING??? 25233 was noted eastbound at Manchester Victoria with coaching stock on April 11th. On September 2nd 25233 worked the afternoon Perth Yard - Millerhill goods, comprised of two empty vans being returned to Rowntrees at York. The 14.44 Glasgow Queen Street - Dundee was worked by 25233 on November 11th. The last recorded passenger workings occurred in 1982, on September 24th 25233 worked the 12.50 Carlisle - Glasgow Central, whilst the final working, a short one took place on October 11th 1982 with the 20.55 Euston - Mallaig between Mossend Yard & Cowlairs Junction. 25233 was stabled at Warrington Arpley on January 16th. The Mountsorrel – Kennett stone trains had seen few Class 25s in recent months, however on February 8th 25048 & 25233 made a rare run into East Anglia on this service. Condition Final: blue/yellow livery, gangway doors sheeted over, blanking plates fitted, hand/footholds plated over, straight sided sandboxes, three-rung bogie mounted footsteps, brackets and other fitting removed from center of cab front (both cabs), off-white display in both headcode boxes. Photograph courtesy Mark Cook 25233 at Stratford during March 1983. 25233 was removed from Stratford on or about April 16th 1983 by 25316, being taken to Cricklewood.